Lit. stooping basin. 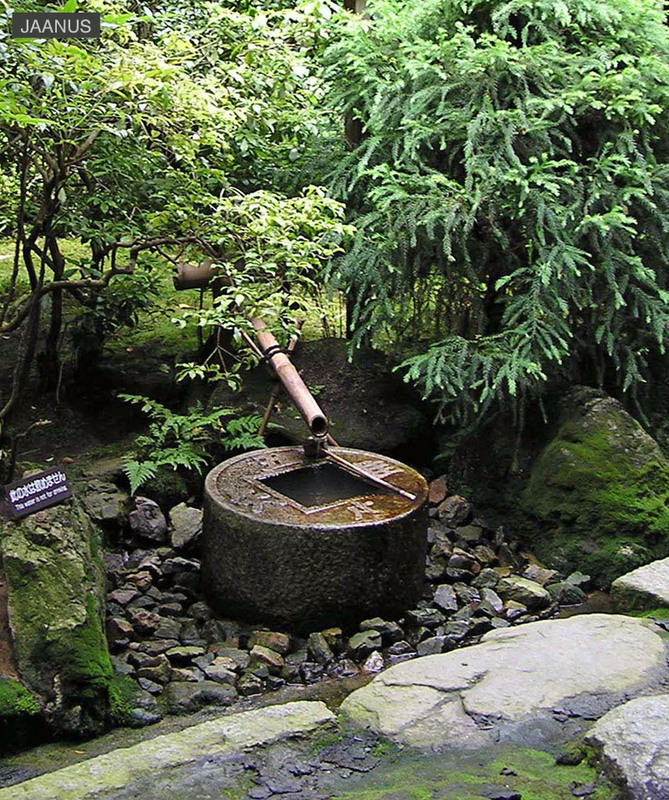 A low wash basin used in a tea garden. One has to stoop down to use the basin, hence the name. Before guests enter a tea ceremony room, they must wash their hands and rinse their mouths. The custom was adopted from people washing their hands in streams or purifying themselves at holy washing troughs at shrines before worshipping the gods. A stone with a depression may serve as a wash basin, and a ladle is sometimes provided for the guests use. Sometimes the water is poured into the basin from a bamboo conduit that stops and starts the flow of water depending on the weight of the water flowing into it. A lantern is placed nearby and stones with various roles *yaku-ishi 役石, are often arranged around the tsukubai. The following are arrangements of stones and wash basins used in tea gardens: 1) A wash basin that is arranged in a dry stream or a stream issuing from a pond. This has no trump stones. 2) A water basin which has only one stone in front of it *mae-ishi 前石. This simple arrangement is thought to be the earliest type. 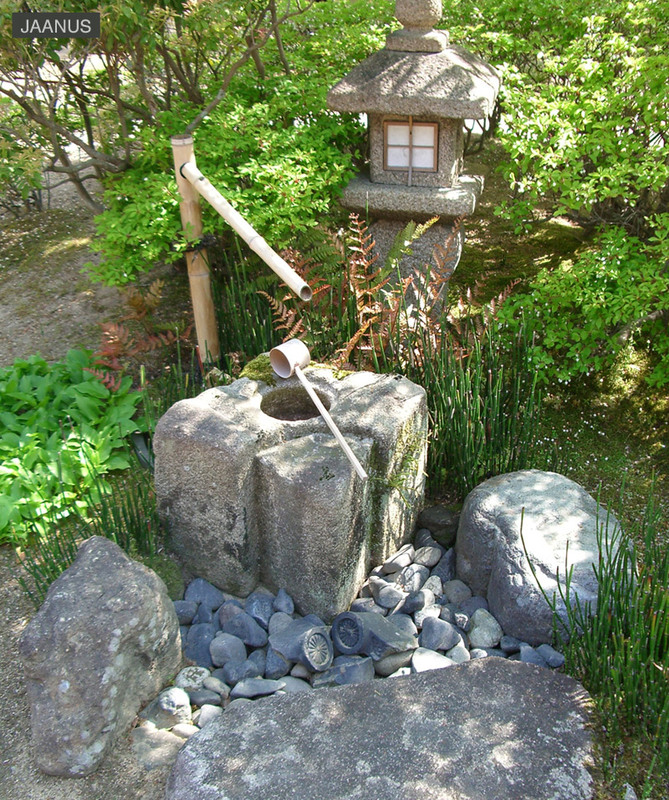 3) A wash basin with various stones around it: often the *teshoku-ishi 手燭石 and *yuoke-ishi 湯桶石 to right and left, the suimon 水門 in the centre and mae-ishi in front. 4) A basin called oritsukubai 降り蹲踞, which is built below ground level, with stone steps leading down to it. Other arrangements include: a tsukubai that is placed either to the left or right side of the entrance to a tea ceremony room facing it; a tsukubai is that placed under a roof provided by a lean-to shelter in front of the entrance; and a tskubai placed in the corner of packed earthen floor in front of the entrance to the tea room. The latter is called uchitsukubai. 内蹲踞.